a French philosopher, Law professor, sociologist, theologian, and Christian anarchist. He wrote several books about the "technological society", and about Christianity and politics, such as Anarchy and Christianity (1991)—arguing that anarchism and Christianity are socially following the same goal. 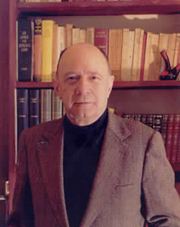 A philosopher who approached technology from a deterministic viewpoint, Ellul, professor at the University of Bordeaux, authored some 40 books and hundreds of articles over his lifetime, the dominant theme of which has been the threat to human freedom and Christian faith created by modern technology. His constant concern has been the emergence of a "technological tyranny" over humanity. As a philosopher and theologian, he further explored the religiosity of the technological society. Jacques Ellul is currently considered a "single author." If one or more works are by a distinct, homonymous authors, go ahead and split the author. Jacques Ellul is composed of 8 names. You can examine and separate out names.